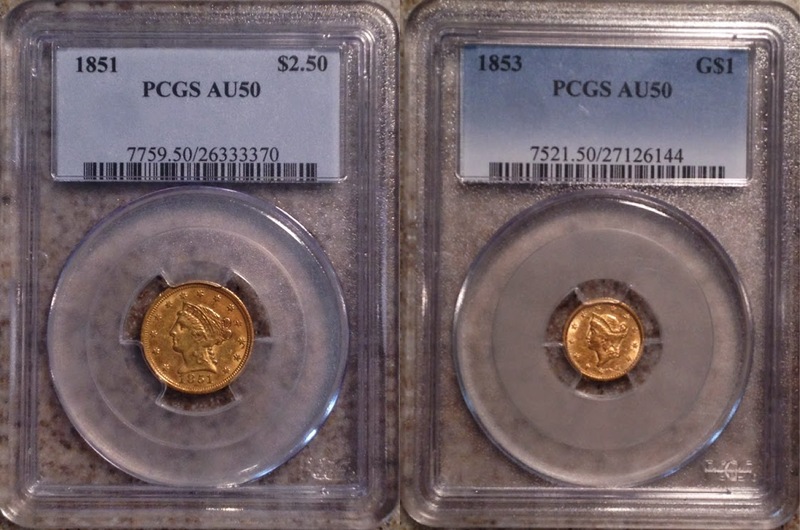 Tony Lawrence's Coins & Stuff: Gold! Together, these four coins are a little less than one ounce of gold. They are all the gold that I own. I'm not a big fan of gold as an investment. I think it can be an excellent hedge against inflation, but there are times when it is over valued and those are not the times to be buying. I think that right now, with gold at $1,294.30 per ounce as I write this, is one of those times. I could be wrong, of course. I'm no expert on this; I'm trusting my gut from a lifetime of experience. I think gold should be around $700 - $900 today and is only higher because of speculation and possibly manipulation by large stakeholders. Why I think that is because of gold's purchasing power over time. That's what really matters. How many ounces of gold would you need to buy a home in 1908, for example? How many in 1975, 2008 and so on? Depending upon the year you pick, that figure will vary widely, but it quite often settles around 250 ounces. That is, whatever the price of real estate, 250 ounces of gold would buy an average priced home. So if you bought that average home for 250 ounces in 1908, you would also pay around 250 ounces a hundred years later in 2008. That's not an investment, is it? Of course you can pick different years where it would have cost fewer ounces or more. By being in and out of the gold market at specific times, you could have made large profits - it would have cost less gold to buy that home. Those who say owning gold is good always pick those times, of course. But you can equally easily pick times when you would have lost purchasing power over time. That's my point: if you buy at times where gold is low in purchasing power and sell when it is high, you make out. But when is it high and when is it low? Real estate has cycles too, so you can't just compare to that. Sites like MeasuringWorth.com can compare dollars to different kinds goods and labor, but as they explain, it gets very complicated. Advances in manufacturing, food production and the whim of the public affect prices. It is very hard to nail down what a "good" price for gold is at any given time. Like many things, it's easy in retrospect, but really hard in the here and now. Little of that is important to these coins. 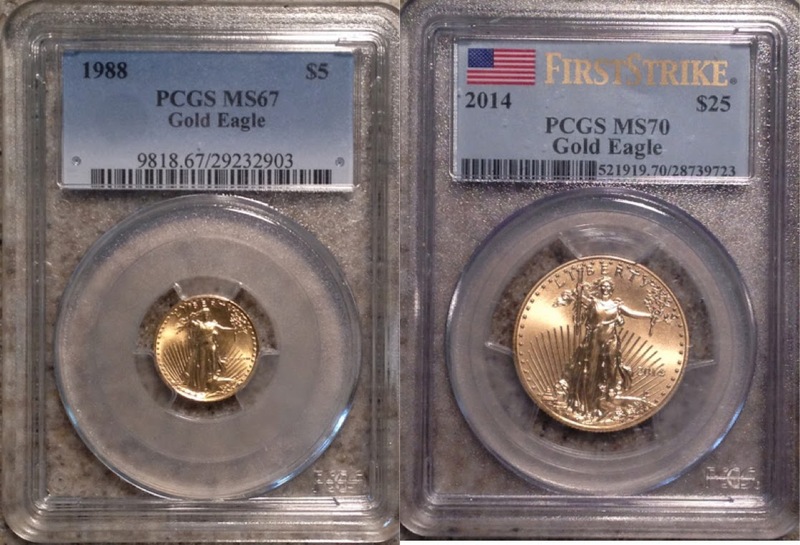 Numismatically, they are worth about $1,900 retail. Part of that value comes from the gold itself, but obviously not all of it. I'd rather own these coins than two ounces of raw gold. They will have numismatic value even if gold prices plunged to $500 an ounce. That's why I would always recommend buying numismatic gold over raw gold.